Planning to going on a trip somewhere for this weekend and want to know how weather will be for next few days of that place so that after you reach there you don’t have to come back with disappointment because of bad weather. So to know all you need to do a simple search on Google type Weather <City Name>, e.g. : I want to know weather of Kolkata then I will type Weather Kolkata and it will show you the current weather information and what weathers looks like for next four days of that place. Or if you want more detailed information then do a search in WolFram|Alpha. All you need you type is Weather <City Name> <Date>. For instance I want to go to Sambalpur (a city in the Indian state of Orissa) for this weekend, so I will type Weather Sambalpur 14/01/2012 – 16/01/2012, I have given two dates because on 14th I will reach there and I want to stay there till 16th of January. 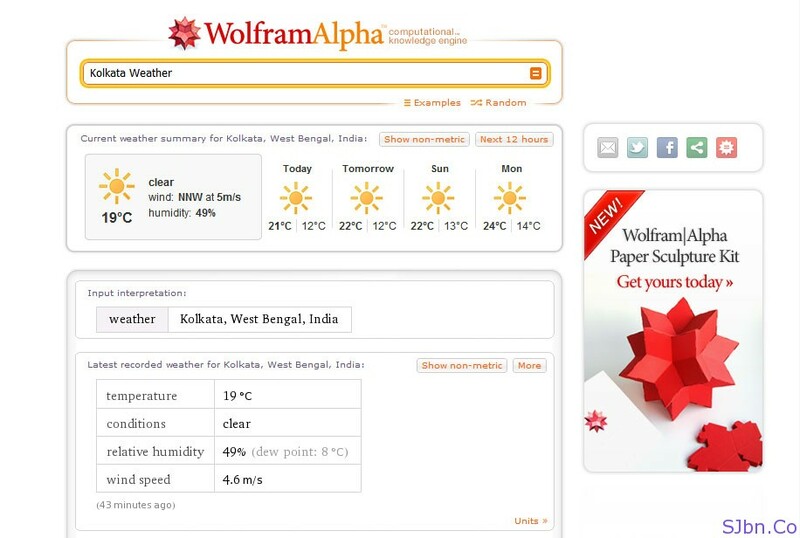 WolFram|Alpha will show you the expected minimum and maximum temperature in C ° (Celsius) and how sky will look. It will also tell you current weather report of that place, like Temperature, Cloud cover, Conditions, Humidity, Wind speed, etc. it will can only tell to future podcast up to next six days. And in case if you want to know historic weather report then you can even know that same as we did to know future weather podcast, type Weather <City Name> <Date>. For instance I am just curious to know how was the weather of Kolkata on 16th July, 1992, so I will simply type Weather Kolkata 16/07/1992. And it will give the detailed report about it of that day. Which includes Precipitation rate, Precipitation amount, Incident sunlight intensity, Historical temperatures for July 16 (for that particular date you entered of every year), Humidity, Wind speed, etc.